Footscray is a major interchange location for the western suburbs, with passengers changing between trains, trams and buses. Despite the recent upgrade to the station, with a new multimillion dollar bridge, nothing has been done about bus stop locations, which are spread around numerous locations around the area, with some stops up to 350 metres from the station. 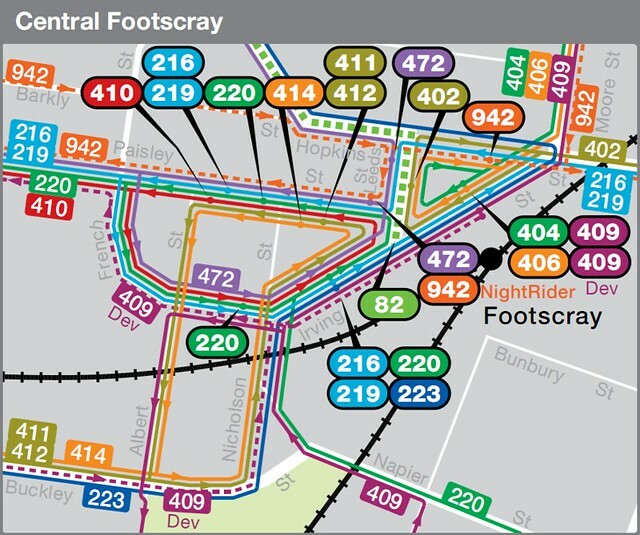 This is not just confusing — it also means that, for instance, routes from Footscray to Highpoint Shopping Centre (82, 223, 406, 409) leave from three separate stops, making it impossible to easily catch the first departing service. And the spaghetti-like lines on this Metlink map are symbolic of the mess that is Melbourne’s bus network.